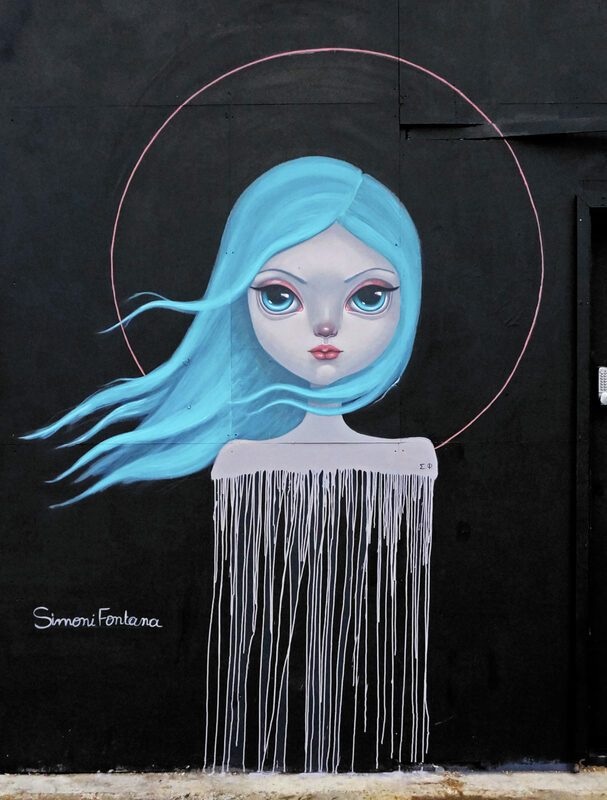 Simoni Fontana is an artist based in Greece. Her style is characterized by an almost childlike innocence and is equally effective on tiny canvases as it is on giant murals. Her references draw from Japanese/Greek iconography, manga, filtered through a sensitive western outlook and her personal aesthetics, dictated by pop surrealism. Fragile and dreamy, the trademark female characters contain traits of the artist, both morphologically and emotionally, thus abstractly hinting to self-portraiture. Opting for absence of extra adornment and simplified characteristics, Simoni uses the bare minimums to tell a story. Despite their aloof naivety, the works have a positively adult undercurrent, touching upon feelings and issues belonging to the grown up world.There is a mystifying element about them, embodying the sum of human interaction, emotions and dreams, and eventually the end of innocence.